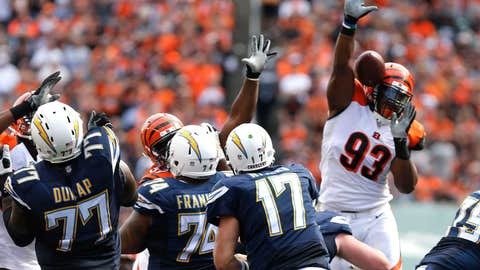 Sep 20, 2015; Cincinnati, OH, USA; Cincinnati Bengals defensive end Will Clarke (93) knocks down a pass from San Diego Chargers quarterback Philip Rivers (17) in the second half at Paul Brown Stadium. The Bengals won 24-19. SAN DIEGO (AP) — Center Chris Watt was practicing on Thursday and that could lead to a new look along the offensive line. Watt missed Sunday’s win over the Cleveland Browns with a groin injury. Trevor Robinson started in his place and received positive reviews. "We love Trevor," Chargers offensive coordinator Frank Reich said. "When he stepped in at the end of last year we really realized that we had a winner. And he’s tough. He is the right guy." The Chargers might move Watt to left guard, with Robinson staying at center for Monday night’s game against the Pittsburgh Steelers. The Chargers’ left side of the offensive line remains in a state of flux. Left tackle King Dunlap (concussion) and left guard Orlando Franklin (ankle) didn’t practice again on Thursday. Neither played against the Browns and their status is unclear for Monday. So with Watt rounding into shape and Robinson impressing the coaches, a switch could be on the horizon. "With Chris it’s always nice to have a guy like him back out there," coach Mike McCoy said. Kenny Wiggins started at left guard on Sunday, but that was before Watt returned to practice. "Only time will tell with that to see how we are doing and how healthy we are," McCoy said. McCoy prides his offensive linemen on being versatile. With Watt, a second-year pro who’s played guard since being at Notre Dame, it could be a smooth transition. "We are going to move guys around," McCoy said. "Whatever the best combination of five guys are, week to week, we will evaluate that. There are a number of things to come into play." Which could leave Watt at left guard. "He’s played it before, both spots here," McCoy said. "He has that position flexibility we are always talking about it and he does a nice job for us." No matter its makeup, the offensive line will be challenged. The Steelers have 14 sacks, fourth best in the NFL. That’s the most sacks they’ve had through four games since getting 15 in 2008. "It’s tradition," McCoy said. "They’ve done an outstanding job for a number of years. It’s the history of their defense the way they get after you — physical against the run and a number of different ways to get after the quarterback. This is what they’ve always done since everyone has ever watched them." In addition to Dunlap and Franklin, others not practicing were: wide receivers Jacoby Jones (ankle) and Steve Johnson (hamstring), cornerback Craig Mager (hamstring) and linebacker Tourek Williams (leg).